Chris Frey was talking about the conference at the last meeting, and the growth to 4000 this year. To put some perspective on it, I asked how big the 2000 NHC was in Livonia that was hosted by our club. Answer was 280. I then asked what the clubs membership is now. Answer was 220. Our club picnic in 2014 will be bigger than the NHC in 2000. Growth like that has driven changes in the NHC and our club. As a member of the GC, I've seen the financials. Take my word for it, it ain't that exciting and there's nothing anybody should be worried about. One of the things we do every year for the annual GC meeting is go through the AHA financials. 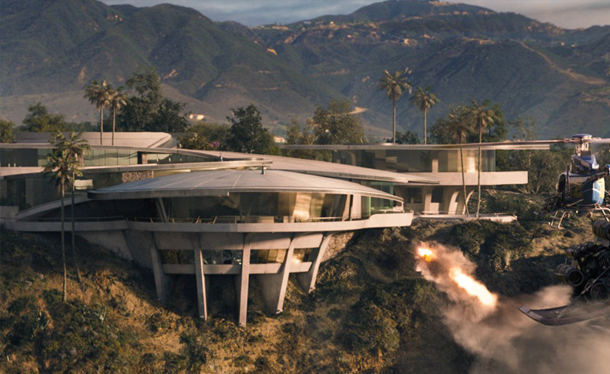 And there's not enough money in the budget for the bullets that are flying at Tony Stark's mansion let alone the Malibu cliffside estate! and Gary typically goes over the financials at a high level in the member meeting. My favorite tactic in one of those conversations is to not be on the defensive. Make them justify their position with facts (intuition and mind reading don't count). It is so easy for some people to drop a load and watch people squirm. "Prove that you don't beat your wife. Go ahead." Nonsense. If you don't have any evidence that I beat my wife, shut up and go away. Its funny, when i originally joine dthe AHA last year i didnt do it because of the benefits that where pointed in my direction, but in supporting the hobby that i have grown to love.... I guess im an odd duck. There will always be negative people that dont feel they need to pay for a membership or club. after a while its not worth the breath. AHA spent some money last year to fly Gary Glass to a meet the legislature event in Jackson, Mississippi. I gotta admit there were about 15 home brewers standing on one side of the room. On the other were Gary Glass, our Raise Your Pints leadership, and the legislators. They worked the room, we served beer, and shortly after we had a brand new home brew law. I for one will never forget what the AHA did for me that night. Ultimately why not be transparent? It will show the boring details to the skeptics and silence them. I have always taken the position that if you want to gripe, step up and volunteer to be one of the leaders. That usually shuts the gadflies mouths, but sometimes there is a valid point made to improve an aspect by being totally open about an organization's finances. By the same token, I have so little funds invested in membership, that I can't see a need to personally inquire. I think the good things happening mean that the funds are very likely going to the right uses. With my free time I would rather brew than stew! Hell, + 1,000,000,000 to this. this is why the AHA exists and just because the last state in the US has passed some form of homebrew legalization doesn't mean that the work is done. you still have to apply for a permit in some states. In some states your not legally allowed to remove your homebrew from your home or share it with anyone outside your family. well, until just this month there were some states where it wasn't technically legal to brew your own beer. now it is largely (not exclusively) because of the dues paid my the membership of the AHA. I don't know anyone local who is a member much less complains about it. Funny, as a long time AHA member it never occurred to me that the AHA owed me a detailed financial report to justify my membership. As mentioned, if you take a long, thorough look at this site and honestly come away needing to be sold more on the merits, then you're blind, dumb, or not serious about membership. Go to work and ask your boss how long he would keep running his company at a loss or break even, all the while having more and more asked of him. I wasn't asking for a detailed report. Just a general overview of what the AHA does period. This is pretty standard for businesses, non-profits, and other associations. I'll be honest a cursory look at the the website DOES NOT tell you these things. Trust me my company website does give me a general overview of what my company and even specifically my product does. I liked Drew's post. I just think it would be beneficial to add some stuff to the 'about the AHA page' and make that a bit more prominent on the site would be very beneficial. If i'm looking to join an organiziation or donate money to a non-profit. The about page is where I'm going to start. I suppose the current about page has some of this information on it but I just feel it could be improved as it doesn't answer many of these general level questions people ask me about why they should join the AHA and how it actually helps the hobby. I just feel if people question these things and I look at the website and I can't provide actual answers for them other than generally "well they help get legislation passed for homebrewing" - how? I will admit I read somewhere that they employeed people other than Gary but I had forgot and I don't see it really listed anywhere on the website. I have to believe this eats up an large portion of the AHA financials. Which employees is a good thing as you need full time paid people to make things happen. To me that information is good to get out there. "Hey we have multiple full-time employees that work hard to help with legislation, organize events across the country, and create content for the website and for the magazine"
Again, I'm not questioning what the AHA does and how it can spend all it's money. I'm just saying when asked what the AHA does in general with the money it has I think the answer should be alittle more... Transparent and easy to come up with. End rant. lol. I really didn't mean to start a big debate. I just couldn't find the answers to questions I was getting the past couple weeks. Dan, I counted 6.5 head count for the AHA. That included .5 for Jill Redding (she edits Zymurgy and Modern Brewer) and Amahl for Zymurgy. If one has gone to several NHCs you will recognize the faces of the AHA people and the BA people the go to the conference to work. Some of you dollars go towards salaries. While transparency is always a good thing, put me on the list of those who are quite happy with the return I get for my dues. I've got to agree with Dan on this one. A simple bullet list of the five or ten outstanding contributions that the AHA has made over the past year would really help defend against the empty rantings of the nay-sayers. Its all well and good to wrap ourselves in righteousness and declare that no one should have the gall to question such an obviously valuable organization, but we should also be able to easily demonstrate exactly why it's so valuable. "Go figure it out for yourself from the Financials" doesn't do that. Gary is roommates with Tony Stark?! I now live in one of those states (Kansas). As of right now, I cannot serve homebrew legally to my fiance even though he helps brew every batch of it because he is not technically "family" yet. The AHA is helping the Kansas clubs' initiative to change that. That alone is worth more than the $38/year rate. But who cares where the money goes? They do a great job furthering the hobby, helping to change laws in very stubborn states (cough, MS, cough), produce a stellar magazine, have tons of information on the website, fund research projects, put on a huge conference every year and maintain the best homebrew forum on the interwebs. What more can you ask for? For some perspective, a lot of people pay $28 a year for BYO. They produce a magazine that recycles basically the same information every 3-5 years. At least Zymurgy is new content every issue. Nobody's up in arms over where that money goes. Why worry about the AHA?